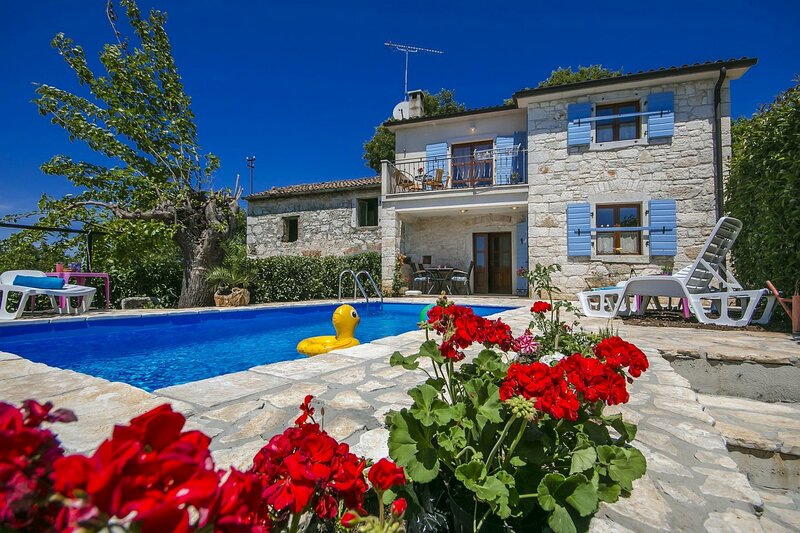 House Irma is an old istrian house located in the small place Fuskulin, only 7 km from Porec, 4 km from the tourist resort Zelena Laguna and 3,5 km from the amusement park Aquacolors. The house was built in 1916, renovated 2009 and the pool was built 2016. During sunny and bright days, the view reaches out to the sea. On enclosed ground of 390 sqm house Irma offers to its guests an open swimming pool of 18 sqm, table and chairs for outside dining, barbecue and two covered parking places. In the tourist resort Zelena Laguna there are supermarkets, ATM, restaurants, pizzerias and cafes, ski lift for water skiing, boat rental and other offers. Holiday house for 4 persons with a total living area of 100 sqm on two floors. On the ground floor there is a living room, kitchen with dining table, shower/toilet. On the first floor are two double bedrooms with exit to a shared balcony, bath/toilet.